Experts Give Their Opinions On: Why Bother Gamifying Your Workplace? 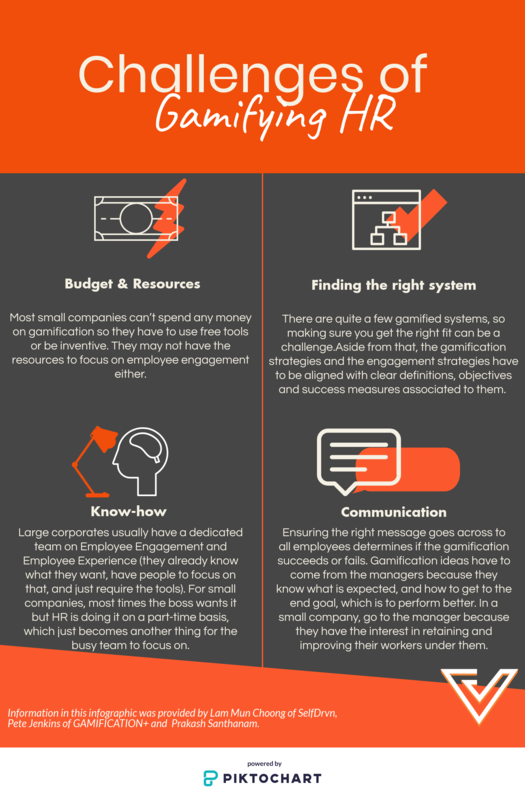 Gamification in the workplace has been trending in the recent years. Businesses now use it for a myriad of purposes, hoping to solve complex challenges, enhance productivity and even to help implement strategies. It’s a way of engaging and tapping into talents which might have been left dormant in the past. Dictionary time: Gamification uses game mechanics in non-gaming contexts to makes business strategies interesting, fun and interactive. It can be applied across most work areas like sales, marketing, customer relationship, employee engagement, recruitment and learning. Gamification can be as simple as incentivising your employees to get into work on time (or even early) through the use of leaderboards. Or, you can reward achievements with appreciation badges or redeemable reward points. The applications are limited only by creativity, but one thing we were curious about were the actual and tangible benefits for companies both large and smalland how do businesses even go about implementing it. We reached out to three industry insiders to pick their minds about gamification in businesses, specifically in the field of HR gamification. Mun Choong is the founder of SelfDrvn Enterprise, a gamified employee engagement platform provider for businesses. He believes that gamifying HR helps small companies differentiate themselves when it comes to competing for talent. 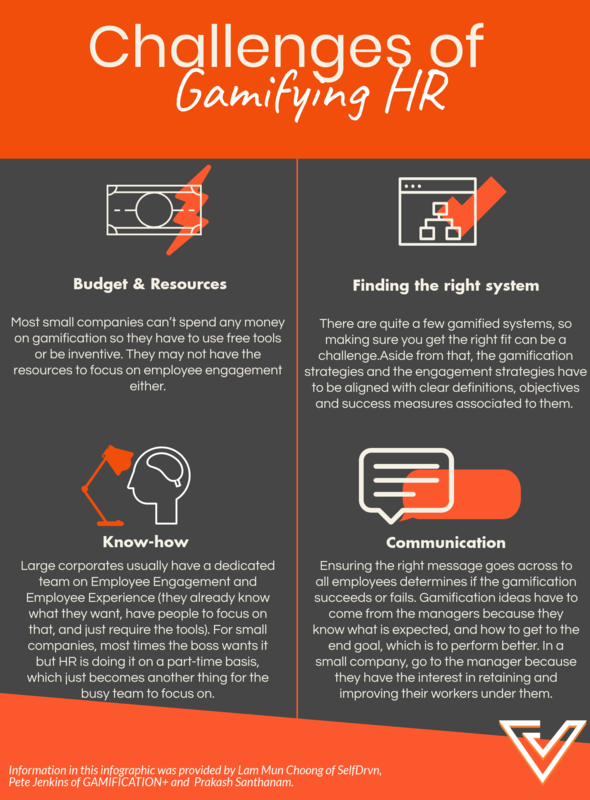 Pete Jenkins—an international speaker, adviser and trainer in gamification, and founder of GAMIFICATION+ in the UK—feels that both small and large companies can reap similar advantages when gamifying HR. He gave the example of the free gamified quiz software Kahoot. Pete introduces his course attendees to Kahoot. When companies actually try it out, “the feedback from all their employees is that it helped make the best training they ever experienced”. Prakash Santhanam is a HR and Talent Management practitioner specialising in learning & capability management, executive coaching, talent engagement and performance management. He pointed out that introducing new initiatives like HR gamification to smaller or larger companies required a similar amount of effort. However, introducing gamification to any company comes with a set of challenges that the industry experts pointed out will have to be overcome before any of the benefits can be enjoyed. As a relatively nascent concept in the workplace, a roadblock that practitioners face when working to gamify HR are the misconceptions around it. He reasoned that gamification can be deceptively simple to implement—you might not even need tech to do it. Older people (e.g. baby boomers) also occasionally come in with their own prejudices about gamification. Speaking about implementation, Pete finds that smaller companies do assume that gamification is expensive to implement, when that is often far from the case. Large companies on the other hand tend to take a one-size-fits-all approach, which also can go wrong. “Large companies think that just using a product of the shelf will solve their problems. 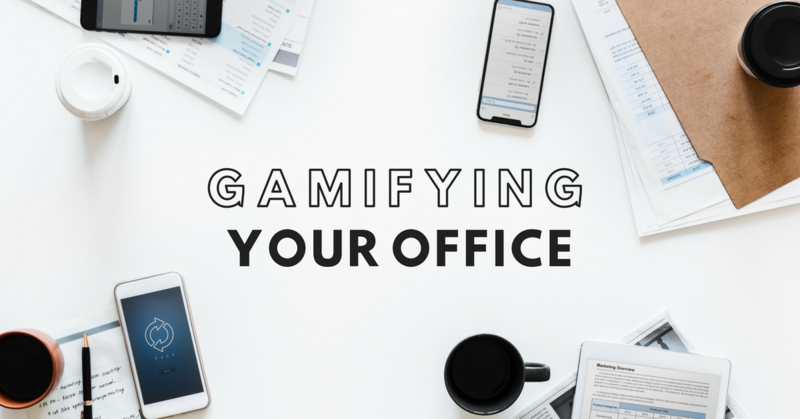 Gamification is about motivating people, people are different everywhere so it needs custom work, modification and plenty of playtesting to fit your business needs and company culture,” said Pete. If you’d like to find out more about gamification, you can check out our previous articles here.